At My First Skool, we empower our children to learn through a pedagogical approach called PETAL© – Playing, Exploring, Thinking, and Applying Learning. This approach provides facilitated play experiences that aid your child's learning and development. 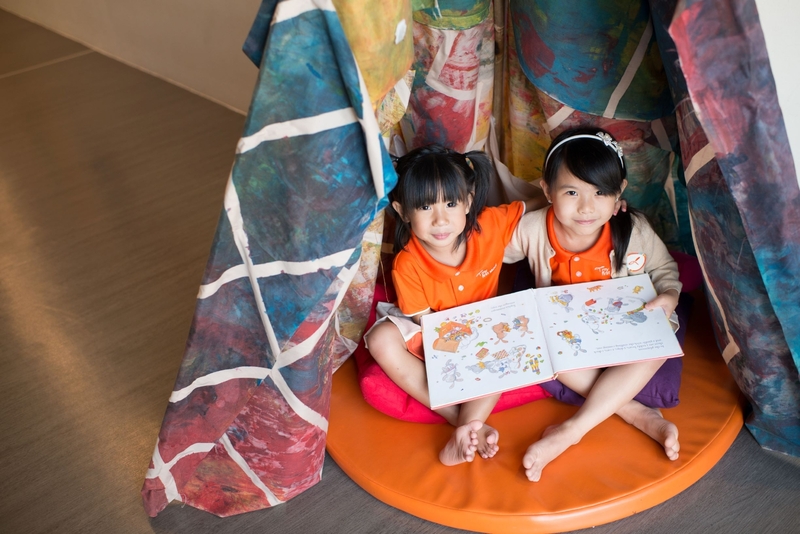 Learning occurs through hands-on games and activities during lessons and at our Learning Corners. E.g. 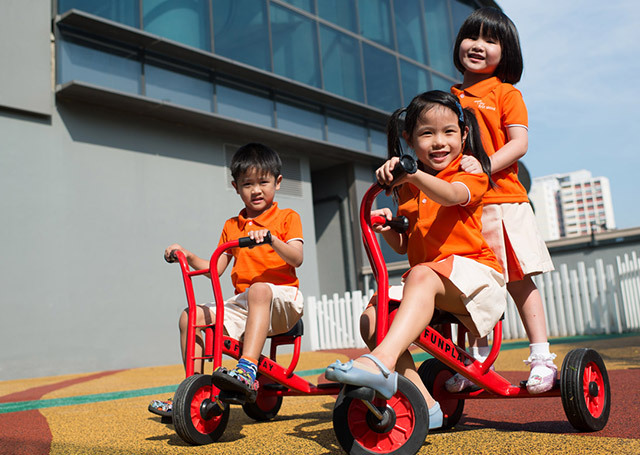 As part of the Kindergarten 2 (K2) plan, children play with ramps and wheels to learn about the properties of wheels. Opportunities for self-exploration allow children to make discoveries and connections. E.g. When the children roll wheels of different shapes down the ramp, they will discover that some wheels roll further due to their shapes. Children are challenged to come up with a solution to a problem. E.g. After discovering how the shape of wheels affects speed and distance, the children will be tasked to build cars with different wheel shapes so as to experience how this affects the speed of each car. Children can apply newly acquired information in new learning situations. E.g. Having acquired some understanding of speed and inclination, the children can now predict which car will move the fastest. Children develop strong listening, speaking, reading and writing skills when given the opportunity to interact with adults and peers. Our children are thus encouraged to participate in class discussions and learn to do public speaking via show-and-tell sessions. They will also be given opportunities to develop writing skills via activities such as writing birthday cards for their classmates. Our goal is to develop our children to be confident and effective communicators in life. Children acquire numeracy concepts and skills through the use of concrete materials, pictures and symbols. 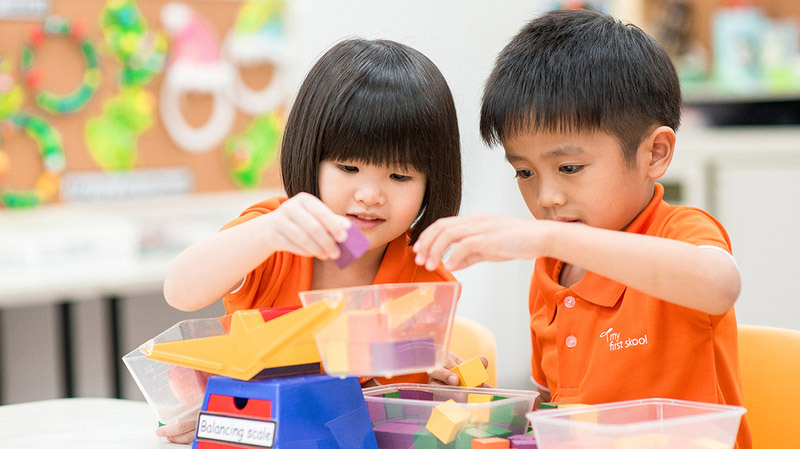 For instance, through sorting shapes, weighing fruits, placing objects in order of big to small, telling time and counting money, they become prepared for more advanced numeracy concepts in primary school. Our children are encouraged to observe and talk about living things, non-living things, places and events around them. We will have termly fieldtrips (to the zoo, park, neighbourhood etc) and lessons to help them discover more about their bodies, animals, plants and properties of materials. Children will be able to widen their knowledge, acquire the essential skills and understanding to make sense of the world around them through such activities. This helps to sustain their curiosity to explore the world and lays the foundation for geography, history and science lessons in the future. At My First Skool, we will have two to three days of planned outdoor activities weekly where children acquire and practise their locomotor skills (running, jumping and skipping) and manipulative skills (throwing, catching and kicking). There are also writing and art activities, where our children develop fine motor skills such as tearing, cutting, folding and drawing. This lays the foundation for them to be more active and inclined to incorporate regular physical activities later on in life, as well as perform different functions that require body coordination. 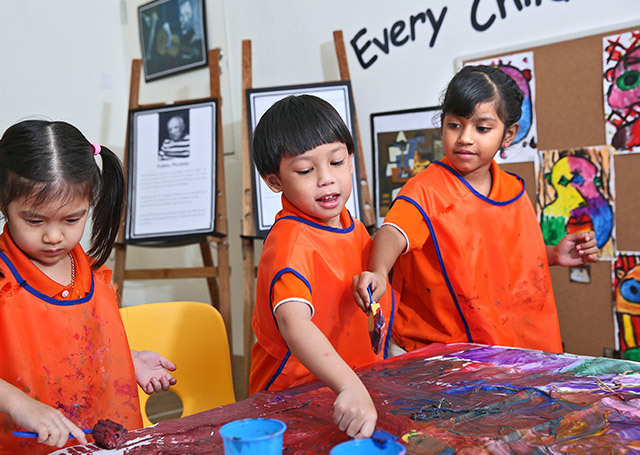 Our children are encouraged to express and represent their ideas, experiences and feelings through the creative arts. 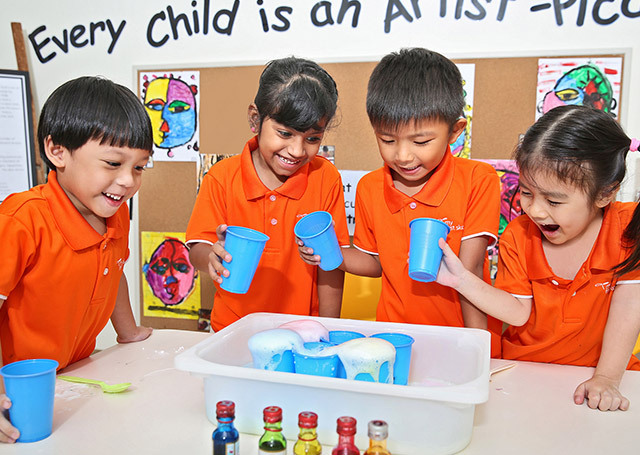 They will get to experiment with a variety of media, tools and techniques to create artworks such chalk drawings, origami and clay models. Besides daily singing and rhyme recitals, there are music and movement activities twice weekly, where they explore elements of music with voice, body movements and musical instruments such as triangles and tambourines. Children will learn how to relate to one another, and work cooperatively in small groups during classroom activities focusing on individuals, family and community. They will have the opportunity to share their likes and dislikes, talk about their feelings, and ultimately, build positive relationships and take responsibility for their actions.